There is no question that high-intensity interval training (HIIT) is ideal for fat loss while also preserving precious muscle tissue. 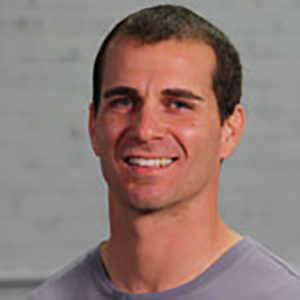 There have been numerous studies, articles, blogs, etc., proclaiming the greatness of HIIT. It burns more calories, increases metabolism and EPOC (excess post-exercise oxygen consumption), preserves muscles, releases growth hormone, targets stubborn fat, reduces insulin resistance, increases endurance, all in a fraction of the time of long, slow cardio. 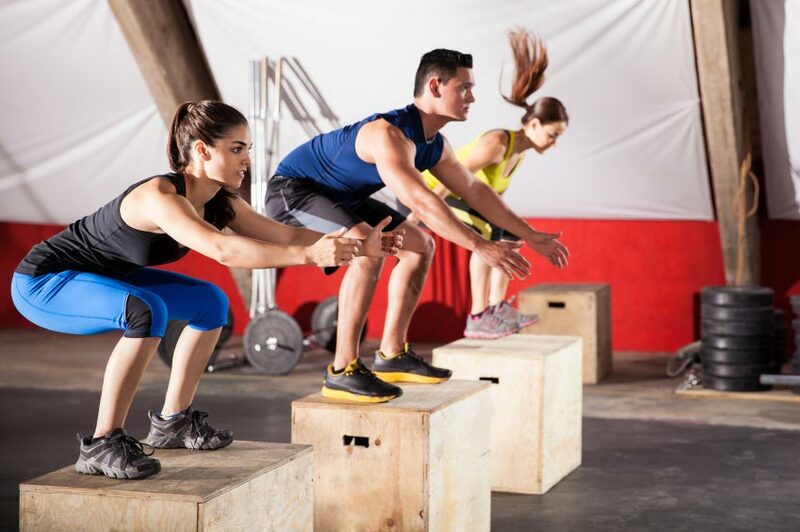 There are countless ways to implement HIIT into your workouts, whether through cardiovascular training, weight training or a combination of the two. The basic take-home point of interval training is to achieve a high heart rate in the zone of 80 to 95 percent of your estimated max heart rate for a short duration of time (from 10 seconds to three minutes). Follow this with a brief cool-down period, bringing your heart rate back into your cardiovascular zone, usually about 50 to 75 percent of your max heart rate. You do not necessarily need to do “cardio” even in the form of HIIT to get the same results. If you are looking to increase your strength, endurance, build and preserve muscle all while burning fat so that your ideal figure shines through, then do HIIT weight training workouts! They key is to move quickly like a circuit from one exercise to another with very little rest, while also incorporating higher intensity exercise that raises your heart rate and makes you sweat. Your boring weight training workouts will definitely feel like cardio, effectively killing two birds with one stone. Everyone is individual and unique, so specific weights for the following workouts are not provided. Your goal is to feel the burn and max yourself out by the number of repetitions listed. If the repetition range is eight, you will lift a heavier weight than if the range was 15. This may take some guesswork and testing on your part. Pick a weight that you think you can handle for the listed reps. If it feels too light (and you could continue lifting that weight beyond the listed repetitions), increase the weight for the next round. Make a note of the weight you lift, so you can try to lift a little heavier every few weeks. Remember, gains and improvements are made when you step outside your comfort zone, so if you are “comfortable” lifting the weights, increase it a bit to achieve results faster and more effectively! -Always start each program with a light five-minute cardio warm-up. -Modify as necessary—these are merely guidelines, so push yourself, but don’t kill yourself. Work smart! -Get a heart-rate monitor, which makes tracking progress and getting to within your estimated max heart rate so much easier. To find your estimated max heart rate, subtract your age from 220. For example, a 30-year-old has an estimated max heart rate of 190, so 90 percent of his or her max heart rate is 162 beats per minute. -Form matters more than anything! You may be able to lift a weight for the given repetition range, but if you are struggling and your form is bad, decrease your weight until you can complete the set with good form. 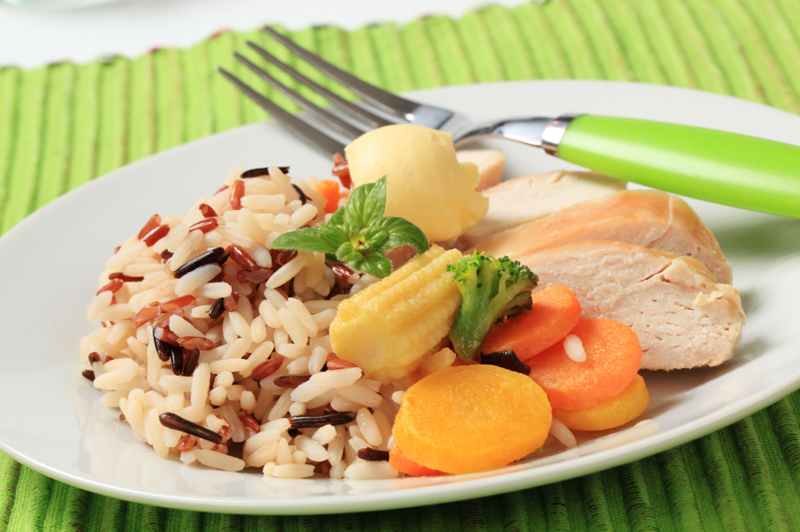 -Talk to a doctor before starting any new exercise program. Pull the bar to the top of the chest and lean back slightly. Keep elbows wide, chest up and squeeze your shoulder blades down and together. Do not hunch forward. 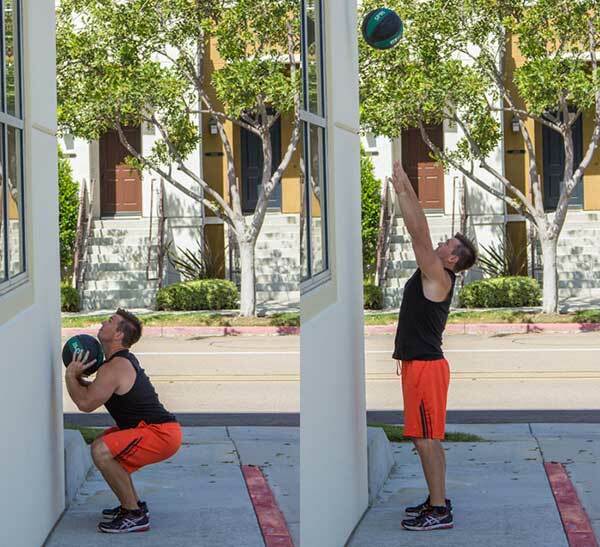 Stand facing a sturdy wall with a 10- to 20-pound medicine ball. Squat, and as you stand up, throw the ball as high as you can so it bounces off the wall at peak height. Catch the ball and squat. If you do not have a sturdy wall, try this exercise with a partner. Position the hands on a bench and the feet on the floor. Maintain a plank position throughout the movement, pausing at the bottom position for about two seconds. Set a cable machine with a single-arm handle to waist level. Face the cable and grip the handle with your right hand, keeping the palm facing inward toward your body. Do a squat and as you stand up, pull the cable to your waist, squeezing your back muscles to execute a row. 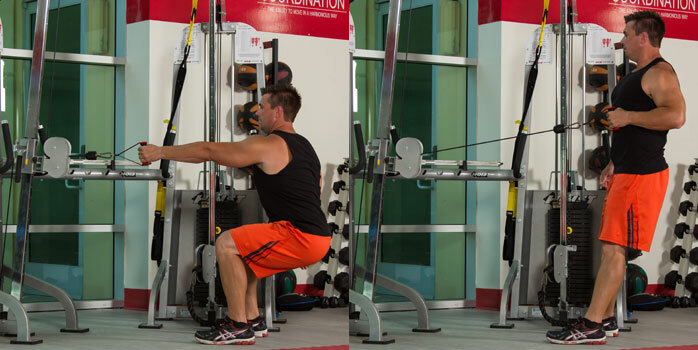 Straighten your arm back out and lower into your squat. Try to get some air while doing a push-up! Advanced exercisers can try this on the ground, while beginners can use a wall and position the body at a slight angle. Push off the wall so you finish standing almost straight up, then fall back into the wall (with control) and do a push-up. Progress to a bench or to the floor on your knees. Control the movement on the way down. Pause at the bottom and the top for maximum muscle contraction. Using light weights (5 to 10 pounds), perform a lateral raise to shoulder level. Lower the weights back down to your sides and do a frontal raise to shoulder level. Repeat for designated time. This will burn out your shoulders while raising your heart rate! Grab a dumbbell, about 10 to 20 pounds. Do a bench plank on your elbows or a floor plank on your hands, with your feet about shoulder-width apart. 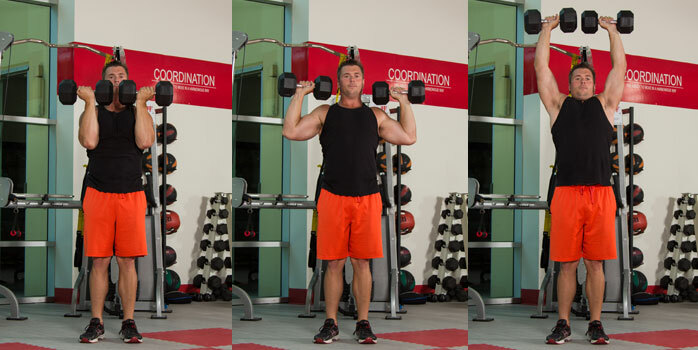 With one arm, grab the dumbbell and bend your elbow to lift the dumbbell up to your side, executing a row. Slowly lower it back down. 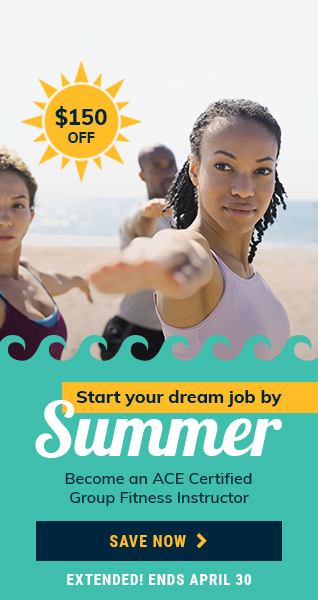 Do not allow your hips to swivel or move; maintain a tight active plank. Lie on your back with the knees bent. Grasp a 10- to 20-pound medicine ball to your chest. Press it and throw it straight up as high as you can. Catch it, bring it back to your chest and immediately throw it again. Start with your hands in front of your head, palms turned toward your face, a dumbbell in each hand. 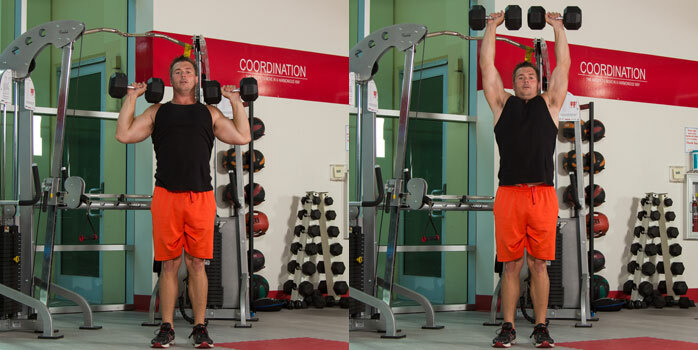 Bring the weights out to the sides while simultaneously rotating your hands forward. 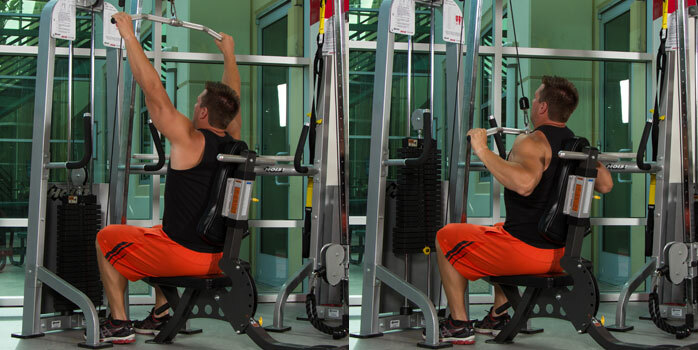 Execute a shoulder press. Lower back down so the weights are at ear level, and then bring the elbows forward again while rotating the hands to finish in starting position. 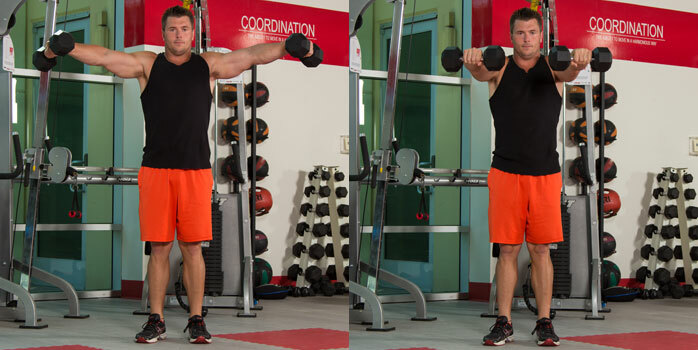 Grab a dumbbell at one end with both hands and stand with feet shoulder-width apart. Squat and let the dumbbell hang between your knees. Press your hips forward as you stand and swing the dumbbell up. Keeping your arms straight, swing the dumbbell up until it reaches head-height; the dumbbell should be parallel with the ground. Slow your downward movement and control the dumbbell as you lower it and then finish in squat. This is similar to a kettlebell swing, with a few minor changes. Kettlebell swings primarily target your glutes and hamstrings; this exercise also incorporates your upper body because you execute complete control over the weight as you lower it back down slowly.